Home Articles How Often Do You Replace Your Carry Rounds? How Often Do You Replace Your Carry Rounds? The problem is, a lot of people probably do not shoot their carry rounds often enough. Ammo carried in your CCW is not the same as ammo stored in boxes in your house. The critical components are the primers and the powder. With proper storage, they last for years. “Primer shelf life is highly dependent on storage conditions. When stored within SAAMI guidelines, primer shelf life is indefinite. Heat and moisture are the most detrimental factors in primer deterioration,” says Jared Hinton, a spokesman for Federal Premium Ammunition. Packing a CCW every day through extremes of heat and cold, humid and dry weather are not ideal conditions. It can and it will affect ammunition performance. Here is a brief rundown of the things that happen to your CCW and the ammo you carry. Items held close to your body, especially in hot weather, are going come into contact with the sweat from your body. If you carry in a holster, you can easily see how your body affects your CCW. After a really hot day, take it out the holster and give a deep sniff. You are smelling the body oils and sweat that soaked into the holster. The same is getting into your carry rounds. My holster is well-stained from years of carry. If you get caught in the rain, the ammo can get wet. If you ankle-carry, splashed water that soaks your pants also gets into the gun. For those of us who CCW while hunting and fishing, fall into the water one time and that’s enough to ruin the ammo in your gun. Smokeless powder and primers that get moisture into them are not reliable. If you pack, you also know there are some places where you are not allowed to take your carry piece. If you have to leave your carry piece in your vehicle, it is going to get hot. Heat Kills has an article showing how hot it can get inside a vehicle. The article is aimed at pet owners, but high heat is still a problem for primers and powder. Tournament shooters can testify to this as well. Joseph von Benedikt describes a problem he had with temperature variations as extreme as those in a hot car. If you are looking for solutions to these problems you have two. Some people put a primer sealant on the primers and the bullet. The sealant is only as good as your application and the sealant. Done right, the sealant should protect your ammo from water. Does it hold up under sweat? “Our skin has a thin, protective layer on its surface, referred to as the acid mantle. This acid mantle is made up of sebum (free fatty acids) excreted from the skin’s sebaceous glands, which mixes with lactic and amino acids from sweat to create the skin’s pH, which ideally should be slightly acidic – at about 5.5,” says a skin care article. A pH level of 7 is considered neutral. So how bad is 5.5? Don’t wipe down your guns after handling them and you will see. “It is generally agreed upon that any food or beverage at a pH of 5.5 or lower has the potential to promote enamel erosion in people whose teeth are highly susceptible to decay,” said Dr. Martha Rich. How well a sealant holds up under long term heat, like being in your car, is another matter. The sealant won’t protect the primer and powder from the heat in any case. Ask this question. Your carry ammo has gone through heat, cold, sweat, water and bounced around by being on your person for many days. Are you willing to trust your life to a primer sealant? If you go to a range and shoot your carry rounds you accomplish two things. 1. You must now replace the spent ammo. Fresh ammunition, stored properly, does not suffer from the potential misfires and non-fires. You can carry in confidence. 2. You get in range time and practice. 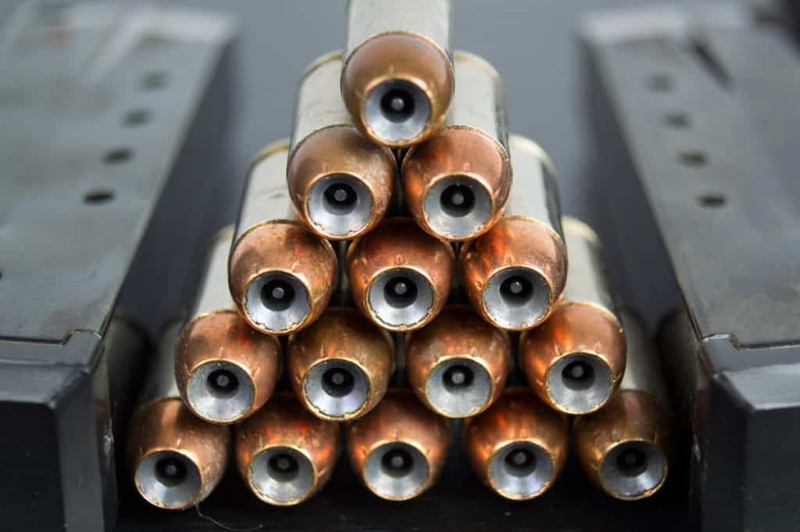 “Any time ammo is exposed to excessive heat, or wet conditions, the ammo should be replaced,” Mr. Hinton said. Previous articleWill the MantisX Fix Your Bad Shooting Habits?